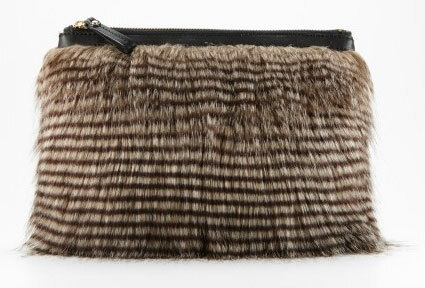 How about this sumptuous (faux) chinchilla bag from... wait for it... Ann Taylor?! It's so fluffy and soft I just want to tuck it under my arm and pet it. Sorry if that sounds creepy! But it's a good one--and just $128. P.S. Santa came through with my Celine! Yay! It is horrible to sell, buy, advertise this bag. Stop killing animals for fashion!! !